All Russia's 2010 World and European champions have been invited to the Kremlin by President Dmitry Medvedev. ­The head of the state admitted it had taken him a while to get a medal count from this year after a series of good Russian performances on the international circuit. The country’s athletes have won over 70 medals in numerous disciplines, including gymnastics, wrestling, swimming and volleyball. 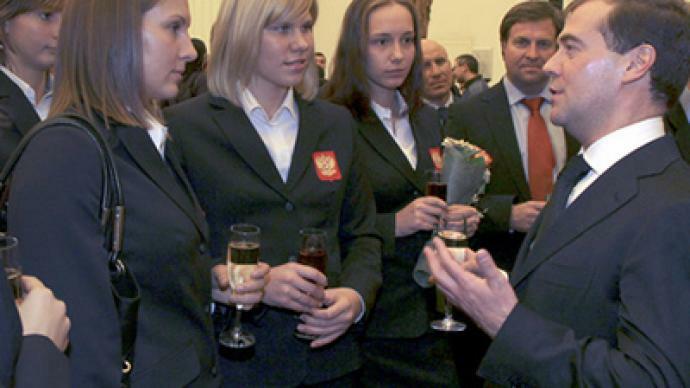 The Russian president had been attending the G-20 summit in Japan, while the volleyball team was also there, so obviously he began his speech by acknowledging their performance – which brought the girls back-to-back world championships – on the weekend. Medvedev wished more victories and the support of their fans for the athletes. “There is another very important part to success, which is rarely talked about, but it is very important for any athlete. And that's the fans. Fan support should not just be on the surface, it should be based on trust – be kind and considerate no matter whether the athlete wins or loses. It happens to everyone, even politicians,” the President said.